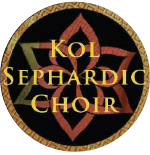 The Kol Sephardic Choir is an upbeat and inspirational musical choir performing original arrangements of Sephardic Romanceros sung in Ladino and Liturgical/Religious songs in Hebrew with Sephardic melodies. The dancers of Pasion Flamenca de Los Angeles have created original choreographies to their music. They have been performing together since 2012.